If you have ever planted carrot or lettuce seeds you know they have the potential to drive a grower insane. Some varieties can be purchased as seed tape, or pellitized to run through a push seeder that drops one at a time. Neither solution works for us. The old types we grow are never available on seed tape or pellitized. Planting by hand results in clumps..carrots end up as dental floss like things rather than a full size carrot. Hand thinning, after hand planting, must occur. We use the Lee Reich method of growing, outlined in his book Weedless Gardening. It has worked well for us, except when it comes to the teeny tiny seeds. Rain washes all the seeds into the aisle ways, in a clump. The wind takes them and moves them on gusty spring days. 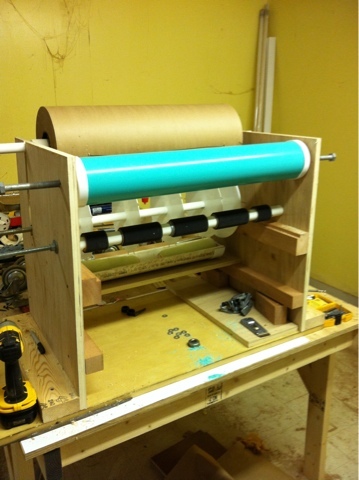 Homer has built his seed plotter in several sizes and iterations. This is how inventors work: using different materials, sizes, weights..until the desired outcome occurs. Last fall we harvested delicious carrots of lovely size and proportion, lettuce that was uniform in size and shape from seeds Homer plotted in late summer. We can't wait for spring so we can get these in the ground..I'm dying for a good carrot..